This cover of The Beatles' 'Drive My Car' celebrates Saudi women's new right to drive . Beatles Radio: The Beatles, Solos, Covers, Birthdays, News The Fab 4 and More! Recently, the comedian James Corden featured the legendary musician Paul McCartney on his popular Late Late Show segment, "Carpool Karaoke." The recurring segment features famous musicians joining Corden in a car while they sing along to the musician’s hits. To the delight of viewers around the globe, McCartney sang songs from The Beatles, including “Drive My Car." Now, it’s doubtful they had Saudi Arabia on their minds when they wheeled out that Beatles classic. But a couple of months ago, both that country and that song were on the minds of many around the world. That's because Saudi Arabia was on the verge of allowing women to drive for the first time ever. It was going to a big moment of freedom for women — the kind of moment that deserves a song. 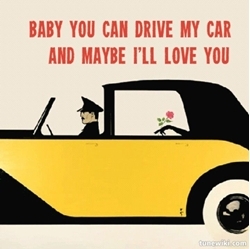 And maybe that song could be some version of The Beatles' "Drive My Car."